More than 26 people have died as “once in a century” snowfall hits the Alps. Over the weekend, three German skiers were killed and a fourth was missing in a huge avalanche in Austria. The men were near the ski resort of Lech am Arlberg in the Tirol region, police said Jan. 13, and were using touring skis, which enable skiers to go “off-piste,” or off marked trails. The men were aged 32, 36, and 57, with a fourth person, 28, still missing. The three were found around 11 p.m. after one of their wives reported them missing, with police using their cellphone signals to track them down. The search for the fourth had to be halted because of the weather. “We received a call around 9 p.m. regarding four missing winter sportsmen,” Manfred Meusburger, leader of the mountain rescue team, told Reuters. The heavy snow that has hit the Alps in the past week has blocked roads and raised the possibility of avalanches, with authorities assigning it a 3 on a scale that goes up to 5. More than 26 people have died in the extreme weather, as more than 10 feet of snow has fallen in some Alpine areas in 48 hours. In France, two ski guides died while trying to prevent avalanches in the Morillon ski resort. Explosive devices they were carrying went off accidentally, triggering a snowslide that engulfed them. 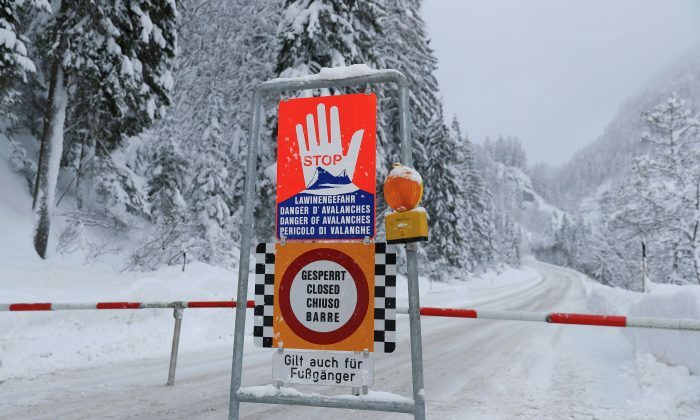 On Jan. 13, over 6,000 people were cut off near Salzburg, Austria, when authorities closed roads because of the threat of avalanches. In one Bavarian ski resort, 2,000 people were likewise stranded by the snow. Last week, three people were injured at the Swiss resort of Schwaegalp after an avalanche hit the restaurant of a hotel. Dozens of people were evacuated from the resort but no one was reported missing, authorities said. The hotel, which was left completely buried in snow, is located at the foot of the Saentis mountain, the highest peak in eastern Switzerland’s Alpstein massif.